Picture six people, two adults and four children, sleeping on straw mats on the bare wooden floor of a room that is barely enough to fit two single beds. These were the conditions my grandma grew up in. These houses would line up in a row forming a long public arcade called ‘five-foot way.’ In the morning, it would be bustling with activities where street hawkers would sell their products to passing pedestrians. “At night when the weather was hot, we would sit along the five-foot way and my parents would tell us stories till it was time for us to go to bed.” Ah Ma said. 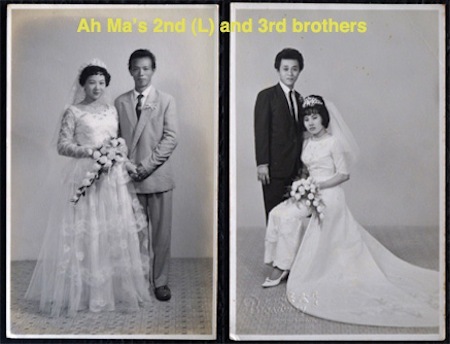 Ah Ma’s parents were married back in their hometown in Fujian, China before her father first moved over to Singapore. Not long after, his wife joined him on this one-way journey. Not long after arriving, they had their first daughter, my grandmother, and three other sons. Life did turn for the better but was certainly far from being a bed of roses. Ah Ma’s father used to be the sole breadwinner where he would work in a factory that made canned pineapple while her mother stayed at home to look after the children. His pay was barely enough to feed them all. By the time Ah Ma turned 10, she was already babysitting children from rich families to help earn $3 (US$2.38) a month, an amount paltry in today’s terms but significant back then. As the eldest, she had to work to help pay for her brothers’ education at the expense of her own chance at attending school. Even till today, Ah Ma remains illiterate, having never been taught or learned how to read or write. She can only speak the Fujian language fluently but do comprehend with a smattering of other languages including Cantonese, Teochew and Malay. Despite the sacrifices made by my grandma to tide through the tough times, her relationships with her brothers remained largely distant. She was only in contact with the eldest of her three brothers, a man I recalled as rather thin and gaunt who smoked quite a bit. (picture above) He passed away not too long ago. As for her two other brothers, I have never met either of them. The next post will be about the Japanese occupation in Singapore, a period of fear and terror that lasted for three years and eight months when grandma was just a young teenage girl. Do stay on for more! You’ve mentioned that your grandmother has never held a pen before, but I was wondering- How did the WWll affect her brothers’ education or just teenagers’ education at that time? Thank you for this great blog post because it records oral history and I admire the way you wrote it. I am exploring the history of Singapore and reading this first person account is very useful. I am enjoying this series very much! I didn’t have enough time to talk to my grandma about life in the past before she passed away. This is bringing back lots of memory, especially short stories my grandma shared with me when I was young. Continue to post! Thanks for the sharing. 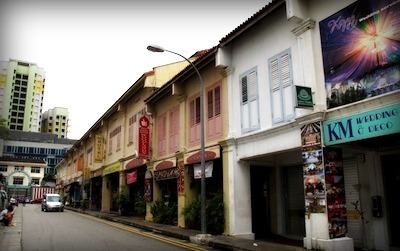 I have been to those row of shophouses in the Singapore, including one that they made into a museum. Very nice.